Posted on March 6, 2015	by Katy K.
I read the whole Old Kingdom series when it first came out, long enough ago that I’ve never reviewed them for my blog, though I’ve recommended them and loaned them out many times since. I was very excited when Clariel came out last fall – except I couldn’t read it just then. Clariel by Garth Nix. Read by Graeme Malcolm. Random House/Listening Library, 2014. This story is set about 600 years before the events of the previous three books, before the great decline of the Old Kingdom. As with the other books, the story opens as a dangerous creature escapes from its bindings and sets off on a mission of destruction before introducing us to our heroine. Clariel is a member of the Abhorsen family, though she hasn’t grown up with them. Her mother, Jaciel, is a master goldsmith, recently invited to leave their home at the edge of the Great Forest to join the Guild in the capital city of Belisaire. Clariel is expected to go to a finishing school for the older children of the well-to-do, in preparation for finding a nice city career or preferably a husband. Clariel wants nothing to do with any of this. Her dream since childhood has been to live and work in the Great Forest, and she’s tried relationships and just isn’t interested. She also knows that stressful situations increase her chances of losing control of the anger that’s always simmering inside her, and nothing is more stressful than a big city where there are no trees and she’s never alone. Though she tells everyone that she needs to be in the forest, including her parents and her advisors at the finishing school, they are all full of reasons why she can’t, including her social status and her help being needed to fight the dangerous free magic creature now loose in the city. Clariel is in some ways very similar to both Sabriel and Lirael. 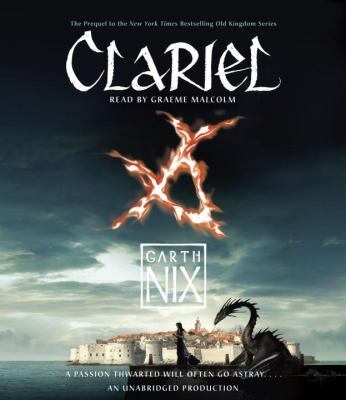 Garth Nix is master of the introverted character, and Clariel is no exception. Like Sabriel and Lirael, Clariel is faced with challenges that she is uniquely able to face, even though she doesn’t quite have all the training that would really be useful. Each book also focuses on a different aspect of the magic of the Old Kingdom – the bells of the necromancer in Sabriel, Charter magic in Lirael and now free magic. (I’m now re-listening to the rest of series, and haven’t yet gotten to Abhorsen.) But though Clariel is a similarly likeable talented but socially awkward young woman, things do not go well for her. This is, as my blogging friend Sondy at Sonderbooks also pointed out, a very sad book. It would be a spoiler, as things don’t start off looking like they’re going that way, except that it’s right there on the cover “A passion thwarted will often go astray…” And as Clariel knows what she needs and is quite articulate about it, it’s heartbreaking. I don’t know that I’d say not to read it, especially for fans of the series. It is really interesting to see the Old Kingdom before its fall, not quite in its prime but certainly vibrant, to see another Abhorsen, and to meet up with Mogget, the free magic cat servant from Sabriel – but while the Old Kingdom is always dark and dangerous, this entry in the series is even darker. The hallmarks of the series are still here – the strong characters (more than just Clariel here, though I’ve only talked about her), the compelling plot, the detailed world with its intricate magic system – but with the edge of hope taken away, it was a lot harder for me to get through. I’ll still read anything Garth Nix cares to write about the Old Kingdom, and I’m very much enjoying my trip back re-reading the rest of the series. This entry was posted in Books and tagged epic fantasy, musical fantasy, teen fantasy. Bookmark the permalink.